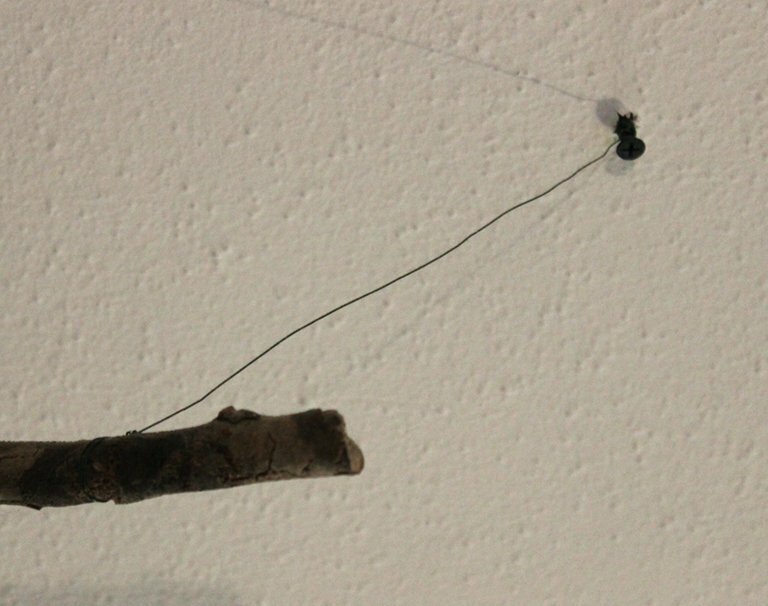 A few readers have commented on a decorating feature in my house that I’ve never really mentioned on my blog: the natural tree branches wired to the ceiling in my living room. I’ve never blogged about it because my friends seem to either love them or really, really hate them- and it’s hard to blog about something that you know will elicit some not-so-great comments. Regardless, I love my ceiling decorated with branches. I think rooms with high ceilings can often feel cold and empty even when well decorated with cozy and welcoming furniture. This was my experience of my tall and narrow living room before the branches were hung. To me, the branches instantly make my living room feel cozy and warm by breaking up the angular lines of the high ceiling. Notice that my branches are hung asymmetrically. 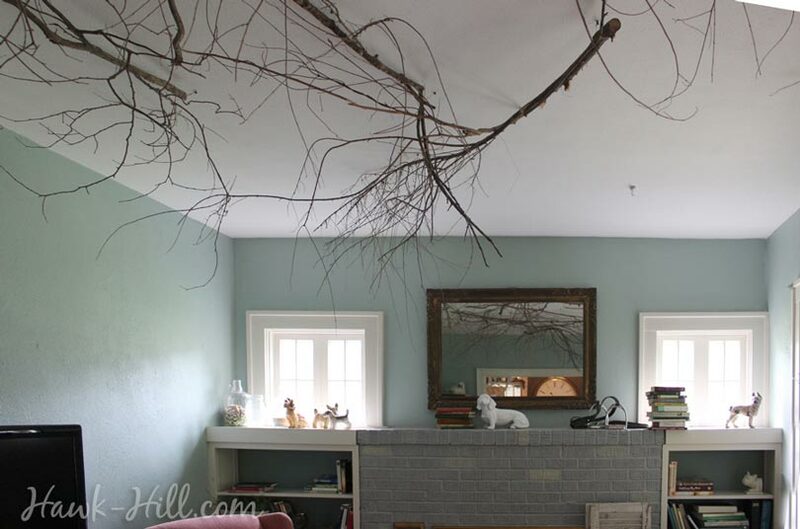 An evenly arranged assortment of branches on the ceiling might feel too uniform for such an organic type of decor. 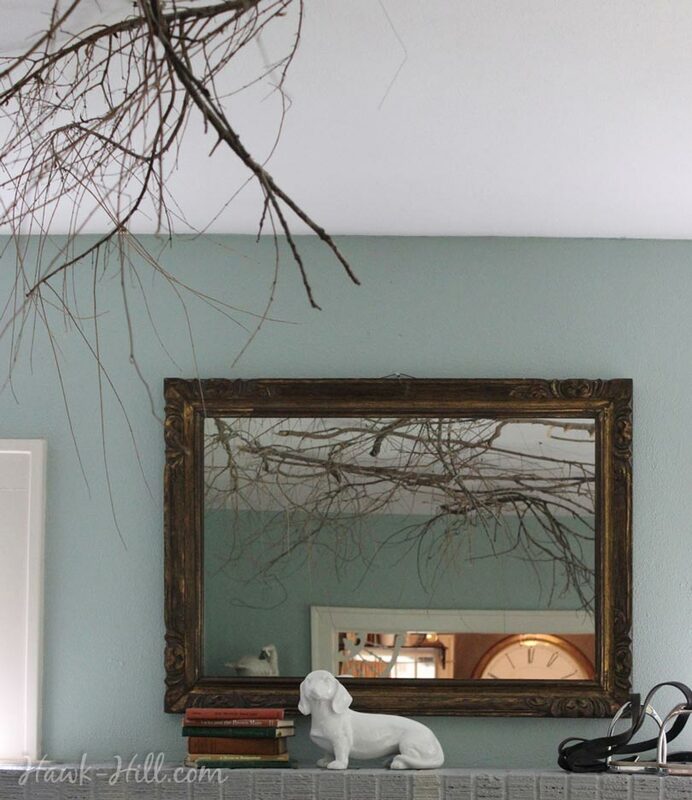 Balancing the branches on one side of the room, then using a carefully placed mirror to reflect them into open space helps create a natural and organic look. 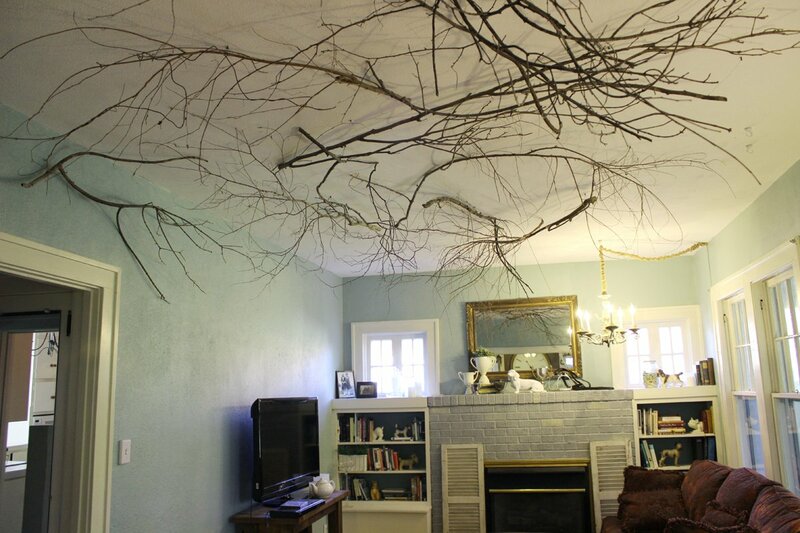 A large vase of branches on the floor could also help vertically balance out asymmetrical branches on the ceiling. Unfortunately I don’t know the type of wood we used, it was harvested from the treeline around Hawk Hill. 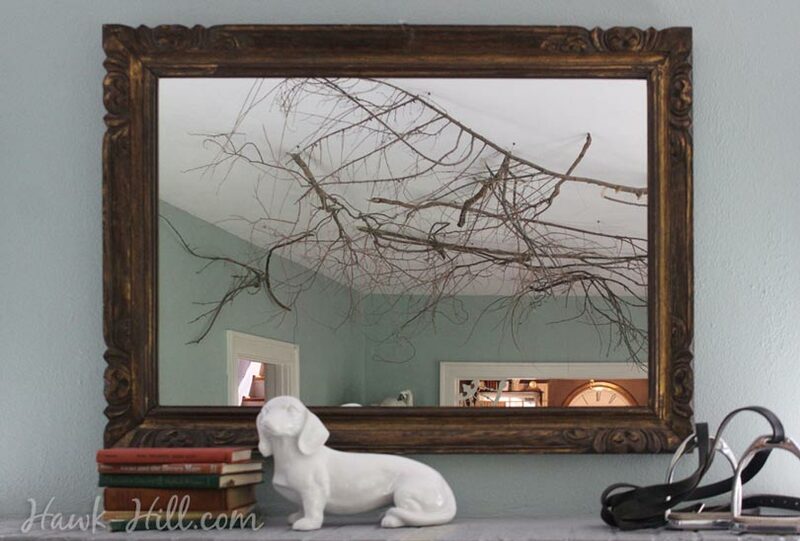 In the past, when my curly willow died, I used curly willow branches for decor and loved the unique shape of the branches. I always intended to plant a new one so that I could harvest branches seasonally for this use or fall decor. It does look like it’s possible to order curly willow branches at a reasonable price, though I still think if you’re into this kind of decor it’s worth raising your own curly willow tree. 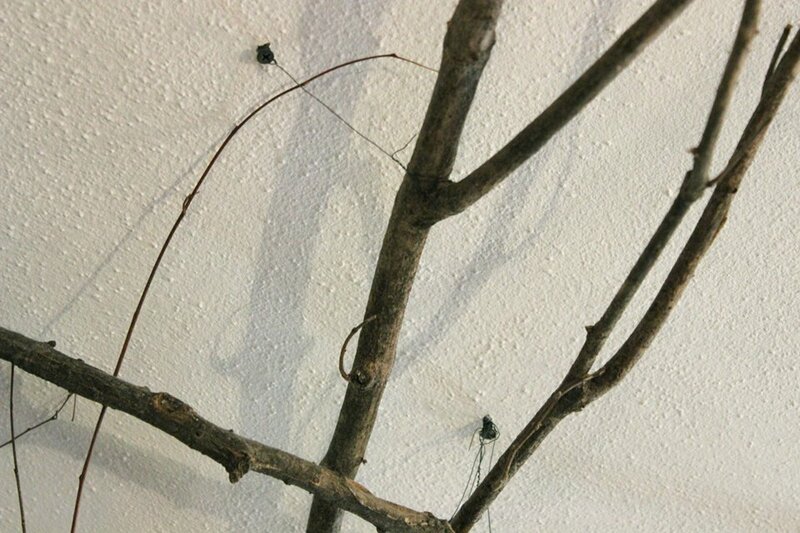 Branches are anchored at multiple points, to secure them to the ceiling without concern about shifting. 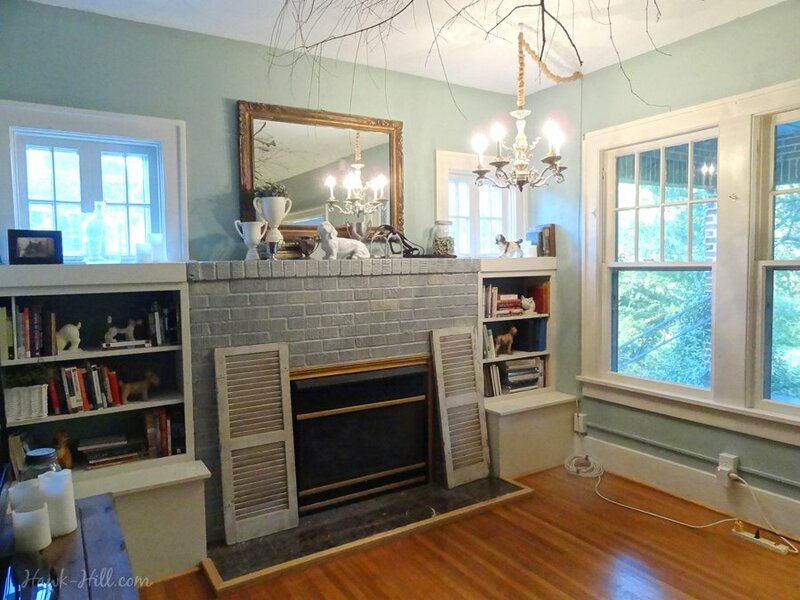 A mirror over the fireplace, tilted slightly upward, helps double the effect of the branches. These branches bring warmth to the room and look great decorated for Christmas! They do get a bit dusty, but in a room without a ceiling fan, air rarely lifts dust up to the 10 ft ceilings in my living room, and what dust is there is masked by the browning grey texture of bark. If you are looking for a way to make your high ceiling living room a little more cozy, maybe this look will work for you too! Tried it? Let me know by posting a comment below!